2.63 Certain characteristic phenomena are associated with an underwater nuclear explosion, but the details vary with the energy yield of the weapon, the distance below the surface at which the detonation occurs, and the depth and area of the body of water. The description given here is based mainly on the observations made at the BAKER test at Bikini in July 1946. In this test, a nuclear weapon of approximately 20-kilotons yield was detonated well below the surface of the lagoon which was about 200 feet deep. These conditions may be regarded as corresponding to a shallow underwater explosion. 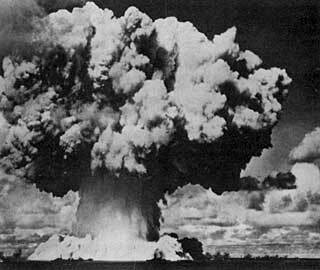 2.64 In an underwater nuclear detonation, a fireball is formed, but it is smaller than for an air burst. 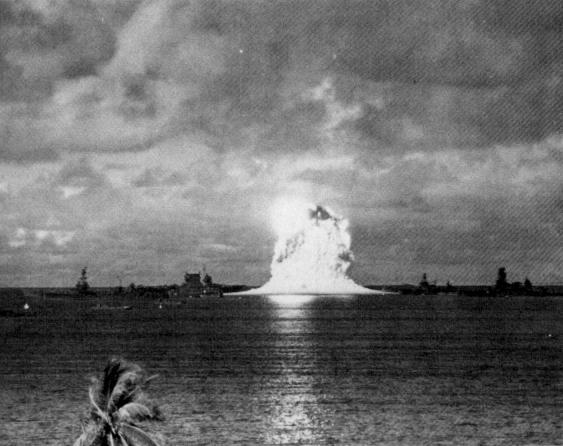 At the BAKER test the water in the vicinity of the explosion was illuminated by the fireball. The distortion caused by the water waves on the surface of the lagoon prevented a clear view of the fireball, and the general effect was similar to that of light seen through a ground-glass screen. The luminosity persisted for a few thousandths of a second, but it disappeared as soon as the bubble of hot, high-pressure gases (or vapors) and steam constituting the fireball reached the water surface. At this time, the gases were expelled and cooled, so that the fireball was no longer visible. 2.65 In the course of its rapid expansion, the hot gas bubble, while still underwater, initiates a shock wave. Intersection of the shock wave with the surface produces an effect which, viewed from above, appears to be a rapidly expanding ring of darkened water. This is often called the "slick" because of its resemblance to an oil slick. Following closely behind the dark region is a white circular patch called the "crack," probably caused by reflection of the water shock wave at the surface. 2.66 Immediately after the appearance of the crack, and prior to the formation of the Wilson cloud (¤ 2.48), a mound or column of broken water and spray, called the "spray dome," is thrown up over the point of burst (Fig. 2.66). This dome is caused by the velocity imparted to the water near the surface by the reflection of the shock wave and to the subsequent breakup of the surface layer into drops of spray. The initial upward velocity of the water is proportional to the pressure of the direct shock wave, and so it is greatest directly above the detonation point. Consequently, the water in the center rises more rapidly (and for a longer time) than water farther away. As a result, the sides of the spray dome become steeper as the water rises. The upward motion is terminated by the downward pull of gravity and the resistance of the air. The total time of rise and the maximum height depend upon the energy of the explosion, and upon its depth below the water surface. Additional slick, crack, and spray-dome phenomena may result if the shock wave reflected from the water bottom and compression waves produced by the gas bubble (¤ 2.86 et seq.) reach the surface with sufficient intensity. Figure 2.66. 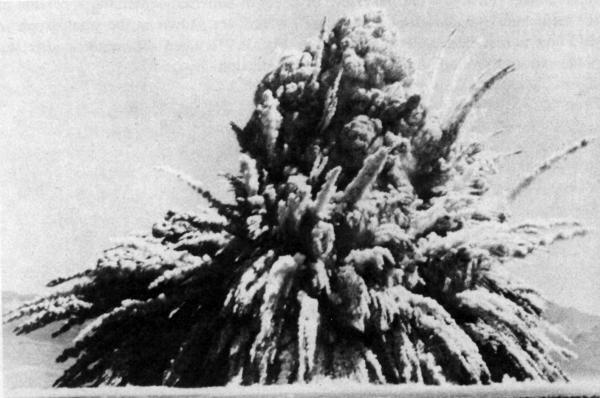 The "spray dome" formed over the point of burst in a shallow underwater explosion. Figure 2.67a. The condensation cloud formed after a shallow underwater explosion. (The "crack" due to the shock wave can be seen on the water surface. Figure 2.67b. Formation of the hollow column in a shallow underwater explosion; the top is surrounded by a late stage of the condensation cloud. 2.68 In the shallow underwater (BAKER) burst at Bikini, the spray dome began to form at about 4 milliseconds after the explosion. 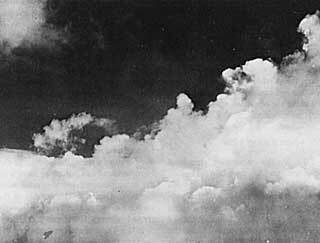 Its initial rate of rise was roughly 2,500 feet per second, but this was rapidly diminished by air resistance and gravity. A few milliseconds later, the hot gas bubble reached the surface of the lagoon and the column began to form, quickly overtaking the spray dome. The maximum height attained by the hollow column, through which the gases vented, could not be estimated exactly because the upper part was surrounded by the radioactive cloud (Fig. 2.68). The column was probably some 6,000 feet high and the maximum diameter was about 2,000 feet. The walls were probably 300 feet thick, and approximately a million tons of water were raised in the column. Figure 2.68. The radioactive cloud and first stages of the base surge following a shallow underwater burst. Water is beginning to fall back from the column into the lagoon..
2.69 The cauliflower-shaped cloud, which concealed part of the upper portion of the column, contained some of the fission products and other weapon residues, as well as a large quantity of water in small droplet form. In addition, there is evidence that material sucked up from the bottom of the lagoon was also present, for a calcareous (or chalky) sediment, which must have dropped from this cloud, was found on the decks of ships some distance from the burst. The cloud was roughly 6,000 feet across and ultimately rose to a height of nearly 10,000 feet before being dispersed. This is considerably less than the height attained by the radioactive cloud in an air burst. 2.70 The disturbance created by the underwater burst caused a series of waves to move outward from the center of the explosion across the surface of Bikini lagoon. At 11 seconds after the detonation, the first wave had a maximum height of 94 feet and was about 1,000 feet from surface zero. This moved outward at high speed and was followed by a series of other waves. At 22,000 feet from surface zero, the ninth wave in the series was the highest with a height of 6 feet. 2.71 It has been observed that certain underwater and water surface bursts have caused unexpectedly serious flooding of nearby beach areas, the depth of inundation being sometimes twice as high as the approaching water wave. The extent of inundation is related in a complex manner to a number of factors which include the energy yield of the explosion, the depth of burst, the depth of the water, the composition and contour of the bottom, and the angle the approaching wave makes with the shoreline. 2.72 As the column (or plume) of water and spray fell back into the lagoon in the BAKER test, there developed a gigantic wave (or cloud) of mist completely surrounding the column at its base (Fig. 2.68). This doughnut-shaped cloud, moving rapidly outward from the column, is called the "base surge." It is essentially a dense cloud of small water droplets, much like the spray at the base of Niagara Falls (or other high water-falls), but having the property of flowing almost as if it were a homogeneous fluid. 2.73 The base surge at Bikini commenced to form at 10 or 12 seconds after the detonation. The surge cloud, billowing upward, rapidly attained a height of 900 feet, and moved outward at an initial rate of more than a mile a minute. Within 4 minutes the outer radius of the cloud, growing rapidly at first and then more slowly, was nearly 3 1/2 miles across and its height had then increased to 1,800 feet. At this stage, the base surge gradually rose from the surface of the water and began to merge with the radioactive cloud and other clouds in the sky (Fig. 2.73). Figure 2.73. The development of the base surge following a shallow underwater explosion. 2.74 After about 5 minutes, the base surge had the appearance of a mass of stratocumulus clouds which eventually reached a thickness of several thousand feet (Fig. 2.74). A moderate to heavy rainfall, moving with the wind and lasting for nearly an hour, developed from the cloud mass. In its early stages the rain was augmented by the small water droplets still descending from the radioactive cloud. Figure 2.74. Final stage in the development of the base surge. 2.75 In the few instances in which base surge formation has been observed over water, the visible configuration has been quite irregular. Nevertheless, to a good approximation, the base surge can be represented as a hollow cylinder with the inner diameter about two-thirds of the outer diameter. The heights of the visible base surge clouds have generally ranged between 1,000 and 2,000 feet. 2.76 The necessary conditions for the formation of a base surge have not been definitely established, although it is reasonably certain that no base surge would accompany bursts at great depths. The underwater test shots upon which the present analysis is based have all created both a visible and an invisible (¤ 2.77) base surge. 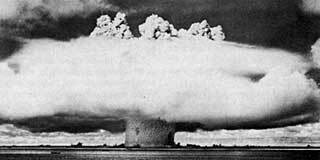 The only marked difference between the phenomena at the various tests is that at Bikini BAKER there was an airborne cloud, evidently composed of fission debris and steam. The other shots, which were at somewhat greater depths, produced no such cloud. The whole of the plume fell back into the surface of the water where the low-lying base surge cloud was formed. 2.77 From the weapons effects standpoint, the importance of the base surge lies in the fact that it is likely to be highly radioactive because of the fission (and other) residues present either at its inception, or dropped into it from the radioactive cloud. Because of its radioactivity, it may represent a hazard for a distance of several miles, especially in the downwind direction. The fission debris is suspended in the form of very small particles that occupy the same volume as the visible base surge at early times, that is, within the first 3 or 4 minutes. However, when the small water droplets which make the base surge visible evaporate and disappear, the radioactive particles and gases remain in the air and continue to move outwards as an invisible radioactive base surge. There may well be some fallout or rainout on to the surface of the water (or ship or shore station) from the radioactive base surge, but in many cases it is expected to pass over without depositing any debris. Thus, according to circumstances, there may or may not be radioactive contamination on the surfaces of objects in the vicinity of a shallow underwater nuclear burst. 2.78 The radioactive base surge continues to expand in the same manner as would have been expected had it remained visible. It drifts downwind either as an invisible, doughnut-shaped cloud or as several such possibly concentric clouds that approximate a low-lying disc with no hole in the center. The latter shape is more probable for deeper bursts. The length of time this base surge remains radioactive will depend on the energy yield of the explosion, the burst depth, and the nearness of the sea bottom to the point of burst. In addition, weather conditions will control depletion of debris due to rain-out and diffusion by atmospheric winds. As a general rule, it is expected that there will be a considerable hazard from the radioactive base surge within the first 5 to 10 minutes after an underwater explosion and a decreasing hazard for half an hour or more. 2.79 The proportion of the residual nuclear radiation that remains in the water or that is trapped by the falling plume and returns immediately to the surface is determined by the location of the burst and the depth of the water, and perhaps also by the nature of the bottom material. Although as much as 90 percent of the fission product and other radioactivity could be left behind in the water, the base surge, both visible and invisible, could still be extremely radioactive in its early stages. 2.80 Essentially all the thermal radiation emitted by the fireball while it is still submerged is absorbed by the surrounding water. When the hot steam and gases reach the surface and expand, the cooling is so rapid that the temperature drops almost immediately to a point where there is no further appreciable emission of thermal radiation. It follows, therefore, that in an underwater nuclear explosion the thermal radiation can be ignored, as far as its effects on people and as a source of fire are concerned. 2.81 It is probable, too, that most of the neutrons and gamma rays liberated within a short time of the initiation of the explosion will also be absorbed by the water. But, when the fireball reaches the surface and vents, the gamma rays (and beta particles) from the fission products will represent a form of initial nuclear radiation. 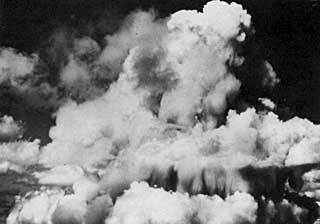 In addition, the radiation from the radioactive residues present in the column, cloud, and base surge, all three of which are formed within a few seconds of the burst, will contribute to the initial effects. 2.82 However, the water fallout (or rainout) from the cloud and the base surge are also responsible for the residual nuclear radiation, as described above. For an underwater burst, it is thus less meaningful to make a sharp distinction between initial and residual radiations, such as is done in the case of an air burst. The initial nuclear radiations merge continuously into those which are produced over a period of time following the nuclear explosion. 2.83 Because the effects of a deep underwater nuclear explosion are largely of military interest, the phenomena will be described in general terms and in less detail than for a shallow underwater burst. The following discussion is based largely on observations made at the WAHOO shot in 1958, when a nuclear weapon was detonated at a depth of 500 feet in deep water. The generation of large-scale water waves in deep underwater bursts will be considered in Chapter VI. 2.84 The spray dome formed by the WAHOO explosion rose to a height of 900 feet above the surface of the water (Fig. 2.84a). Shortly after the maximum height was attained, the hot gas and steam bubble burst through the dome, throwing out a plume with jets in all directions; the highest jets reached an elevation of 1,700 feet (Fig. 2.84b). There was no airborne radioactive cloud, such as was observed in the shallow underwater BAKER shot. The collapse of the plume created a visible base surge extending out to a distance of over 2 miles downwind and reaching a maximum height of about 1,000 feet (Fig. 2.84c). This base surge traveled outward at an initial speed of nearly 75 miles per hour, but decreased within 10 seconds to less than 20 miles per hour. Figure 2.84a. Spray dome observed 5.3 second after the explosion in deep water. Figure 2.84b. Plume observed 11.7 seconds after explosion in deep water. Figure 2.84c. Formation of base surge at 45 seconds after explosion in deep water. 2.85 There was little evidence of the fireball in the WAHOO shot, because of the depth of the burst, and only a small amount of thermal radiation escaped. The initial nuclear radiation was similar to that from a shallow underwater burst, but there was no lingering airborne radioactive cloud from which fallout could occur. The radioactivity was associated with the base surge while it was visible and also after the water droplets had evaporated. The invisible, radioactive base surge continued to expand while moving in the downwind direction. However, very little radioactivity was found on the surface of the water. 2.86 The hot gas bubble formed by a deep underwater nuclear explosion rises through the water and continues to expand at a decreasing rate until a maximum size is reached. If it is not too near the surface or the bottom at this time, the bubble remains nearly spherical. As a result of the outward momentum of the water surrounding the bubble, the latter actually overexpands; that is to say, when it attains its maximum size its contents are at a pressure well below the ambient water pressure. The higher pressure outside the bubble then causes it to contract, resulting in an increase of the pressure within the bubble and condensation of some of the steam. Since the hydrostatic (water) pressure is larger at the bottom of the bubble than at the top, the bubble does not remain spherical during the contraction phase. The bottom moves upward faster than the top (which may even remain stationary) and reaches the top to form a toroidal bubble as viewed from above. This causes turbulence and mixing of the bubble contents with the surrounding water. 2.87 The momentum of the water set in motion by contraction of the bubble causes it to overcontract, and its internal pressure once more becomes higher than the ambient water pressure. A second compression (shock) wave in the water commences after the bubble reaches its minimum volume. This compression wave has a lower peak overpressure but a longer duration than the initial shock wave in the water. A second cycle of bubble expansion and contraction then begins. 2.88 If the detonation occurs far enough below the surface, as in the WIGWAM test in 1955 at a depth of about 2,000 feet, the bubble continues to pulsate and rise, although after three complete cycles enough steam will have condensed to make additional pulsations unlikely. During the pulsation and upward motion of the bubble, the water surrounding the bubble acquires considerable upward momentum and eventually breaks through the surface with a high velocity, e.g., 200 miles per hour in the WIGWAM event, thereby creating a large plume. If water surface breakthrough occurs while the bubble pressure is below ambient, a phenomenon called "blowin" occurs. The plume is then likely to resemble a vertical column which may break up into jets that disintegrate into spray as they travel through the air. 2.89 The activity levels of the radioactive base surge will be affected by the phase of the bubble when it breaks through the water surface. Hence, these levels may be expected to vary widely, and although the initial radiation intensities may be very high, their duration is expected to be short. 2.90 For the present purpose, a shallow underground explosion may be regarded as one which produces a substantial crater resulting from the throwout of earth and rock. There is an optimum depth of burst, dependent on the energy yield of the detonation and the nature of the rock medium, which gives a crater of maximum size. The mechanism of the formation of such throwout (or excavation) craters will be considered here. For shallower depths of burst, the behavior approaches that of a surface burst (¤¤ 2.18, 6.03 et seq. ), whereas for explosions at greater depths the phenomena tend toward those of a deep underground detonation (¤ 2.101 et seq.). 2.91 When a nuclear weapon is exploded under the ground, a sphere of extremely hot, high-pressure gases, including vaporized weapon residues and rock, is formed. This is the equivalent of the fireball in an air or surface burst. The rapid expansion of the gas bubble initiates a ground shock wave which travels in all directions away from the burst point. When the upwardly directed shock (compression) wave reaches the earth's surface, it is reflected back as a rarefaction (or tension) wave. If the tension exceeds the tensile strength of the surface material, the upper layers of the ground will spall, i.e., split off into more-or-less horizontal layers. Then, as a result of the momentum imparted by the incident shock wave, these layers move upward at a speed which may be about 150 (or more) feet per second. 2.92 When it is reflected back from the surface, the rarefaction wave travels into the ground toward the expanding gas sphere (or cavity) produced by the explosion. If the detonation is not at too great a depth, this wave may reach the top of the cavity while it is still growing. The resistance of the ground to the upward growth of the cavity is thus decreased and the cavity expands rapidly in the upward direction. The expanding gases and vapors can thus supply additional energy to the spalled layers, so that their upward motion is sustained for a time or even increased. This effect is referred to as "gas acceleration." 2.93 The ground surface moving upward first assumes the shape of a dome. As the dome continues to increase in height, cracks form through which the cavity gases vent to the atmosphere. The mound then disintegrates completely and the rock fragments are thrown upward and outward (Fig. 2.93). Subsequently, much of the ejected material collapses and falls back, partly into the newly formed crater and partly onto the surrounding "lip." The material that falls back immediately into the crater is called the "fallback," whereas that descending on the lip is called the "ejecta." The size of the remaining (or "apparent") crater depends on the energy yield of the detonation and on the nature of the excavated medium. In general, for equivalent conditions, the volume of the crater is roughly proportional to the yield of the explosion. Figure 2.93. Shallow underground burst. 2.94 The relative extents to which spalling and gas acceleration contribute to the formation of a throwout crater depend to large extent on the moisture content of the rock medium. In rock containing a moderately large proportion of water, the cavity pressure is greatly increased by the presence of water vapor. Gas acceleration then plays an important role in crater formation. In dry rock, however, the contribution of gas acceleration to the upward motion of the ground is generally small and may be unobservable. 2.95 As in an underwater burst, part of the energy released by the weapon in a shallow underground explosion appears as an air blast wave. The fraction of the energy imparted to the air in the form of blast depends primarily on the depth of burst for the given total energy yield. The greater the depth of burst, the smaller, in general, will be the proportion of shock energy that escapes into the air. For a sufficiently deep explosion, there is, of course, no blast wave. 2.96 When the fallback from a shallow underground detonation descends to the ground, it entrains air and fine dust particles which are carried downward. 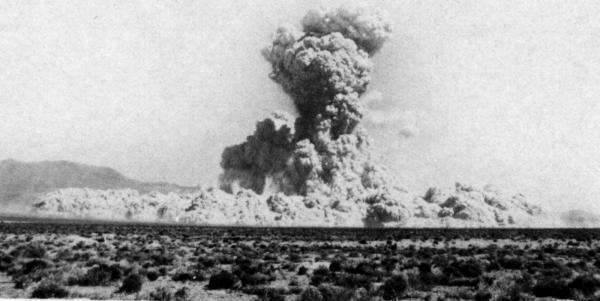 The dust-laden air upon reaching the ground moves outward as a result of its momentum and density, thereby producing a base surge, similar to that observed in shallow underwater explosions. The base surge of dirt particles moves outward from the center of the explosion and is subsequently carried downwind. Eventually the particles settle out and produce radioactive contamination over a large area, the extent of which depends upon the depth of burst, the nature of the soil, and the atmospheric conditions, as well as upon the energy yield of the explosion. A dry sandy terrain would be particularly conducive to base surge formation in an underground burst. 2.97 Throwout crater formation is apparently always accompanied by a base surge. If gas acceleration occurs, however, a cloud consisting of particles of various sizes and the hot gases escaping from the explosion cavity generally also forms and rises to a height of thousands of feet. This is usually referred to as the "main cloud," to distinguish it from the base surge cloud. The latter surrounds the base of the main cloud and spreads out initially to a greater distance. 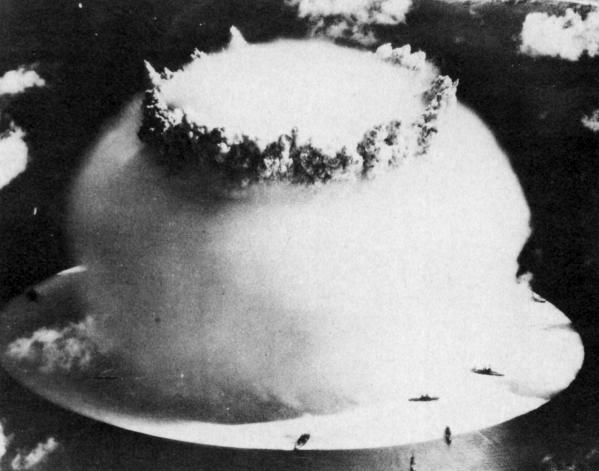 The main cloud and base surge formed in the SEDAN test (100 kilotons yield, depth of burial 635 feet in alluvium containing 7 percent of water) are shown in the photograph in Fig. 2.97, taken six minutes after the explosion. Figure 2.97. Main cloud and base surge after the SEDAN underground burst. 2.98 Both the base surge and the main cloud are contaminated with radioactivity, and the particles present contribute to the fallout. The larger pieces are the first to reach the earth and so they are deposited near the location of the burst. But the smaller particles remain suspended in the air some time and may be carried great distances by the wind before they eventually settle out. 2.99 The situations as regards thermal and nuclear radiations from an underground burst are quite similar to those described above in connection with an underwater explosion. As a general rule, the thermal radiation is almost completely absorbed by the ground material, so that it does not represent a significant hazard. Most of the neutrons and early gamma rays are also removed, although the capture of the neutrons may cause a considerable amount of induced radioactivity in various materials present in the soil (¤ 9.35). This will constitute a small part of the residual nuclear radiation, of importance only in the close vicinity of the point of burst. The remainder of the residual radiation will be due to the contaminated base surge and fallout. 2.100 For the reasons given in ¤2.82 for an underwater burst, the initial and residual radiations from an underground burst tend to merge into one another. The distinction which is made in the case of air and surface bursts is consequently less significant in a subsurface explosion. 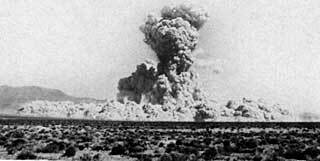 2.101 A deep underground explosion is one occurring at such a depth that the effects are essentially fully contained. The surface above the detonation point may be disturbed, e.g., by the formation of a shallow subsidence crater or a mound, and ground tremors may be detected at a distance. There is no significant venting of the weapon residues to the atmosphere, although some of the noncondensable gases present may seep out gradually through the surface. The United States has conducted many deep underground tests, especially since September 1961. Almost all of the explosion energy has been contained in the ground, and, except in the few cases of accidental venting or seepage of a small fraction of the residues, the radioactivity from these explosions has also been confined. The phenomena of deep underground detonations can be described best in terms of four phases having markedly different time scales. 2.102 First, the explosion energy is released in less than one-millionth part of a second, i.e., less than one microsecond (¤ 1.54 footnote). As a result, the pressure in the hot gas bubble formed will rise to several million atmospheres and the temperature will reach about a million degrees within a few microseconds. In the second (hydrodynamic) stage, which generally is of a few tenths of a second duration, the high pressure of the hot gases initiates a strong shock wave which breaks away and expands in all directions with a velocity equal to or greater than the speed of sound in the rock medium. During the hydrodynamic phase, the hot gases continue to expand, although more slowly than initially, and form a cavity of substantial size. At the end of this phase the cavity will have attained its maximum diameter and its walls will be lined with molten rock. The shock wave will have reached a distance of some hundreds of feet ahead of the cavity and it will have crushed or fractured much of the rock in the region it has traversed. The shock wave will continue to expand and decrease in strength eventually becoming the "head" (or leading) wave of a train of seismic waves (¤ 6.19). During the third stage, the cavity will cool and the molten rock material will collect and solidify at the bottom of the cavity. 2.103 Finally, the gas pressure in the cavity decreases to the point when it can no longer support the overburden. Then, in a matter of seconds to hours, the roof falls in and this is followed by progressive collapse of the overlying rocks. A tall cylinder, commonly referred to as a "chimney," filled with broken rock or rubble is thus formed (Fig. 2.103). If the top of the chimney does not reach the ground surface, an empty space, roughly equivalent to the cavity volume, will remain at the top of the chimney. However, if the collapse of the chimney material should reach the surface, the ground will sink into to the empty space thereby forming a subsidence crater (see Fig. 6.06f). The collapse of the roof and the formation of the chimney represented the fourth (and last) phase of the underground explosion. Figure 2.103. The rubble chimney formed after collapse of the cavity in a deep underground nuclear detonation. 2.104 The effects of the RAINIER event of Operation Plumbbob in 1957 will provide an example of the extent to which the surrounding medium may be affected by a deep underground detonation. RAINIER was a 1.7-kiloton nuclear device detonated in a chamber 6 x 6 x 7 feet in size, at a depth of 790 feet below the surface in a compacted volcanic-ash medium referred to geologically as "tuff." During the hydrodynamic stage the chamber expanded to form a spherical cavity 62 feet in radius, which was lined with molten rock about 4 inches thick. The shock from the explosion crushed the surrounding medium to a radius of 130 feet and fractured it to 180 feet. Seismic signals were detected out to distances of several hundred miles and a weak signal was recorded in Alaska. The chimney extended upward for about 400 feet from the burst point. Further information on cavity and chimney dimensions is given in Chapter VI. 2.105 Deep underground nuclear detonations, especially those of high yield, are followed by a number of minor seismic tremors called "aftershocks," the term that is used to describe the secondary tremors that generally occur after the main shock of a large earthquake. In tests made in Nevada and on Amchitka Island in the Aleutians, the aftershocks have not constituted a danger to people or to structures off the test sites. No correlation has been found between underground nuclear detonations and the occurrence of natural earthquakes in the vicinity (¤ 6.24 et seq. ).